This versatility of our Machine Shop coupled with the vast experience of our machinists and supervisors provide us with an edge over our competitors. Most machine components can be made here cost effectively within specified tolerances to the satisfaction of our customers. 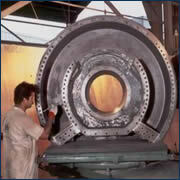 Machining jobs up to 5 Tons in weight can be easily handled in our workshop.